Kitchens are the heart of any home – Kitchens are made for bringing families together! So ladies, spruce up your kitchen with the coolest collection of stainless steel in market by Arttd’inox (from the house of Jindal Stainless Limited) and make it the most striking part of your home. “Our kitchens bring to you different solutions for coordinating the kitchen with the living area, adding functionality and linear style to both environments. Every detail is meticulously designed with a view to enhancing the quality of every single room while also allowing for freedom of movement. 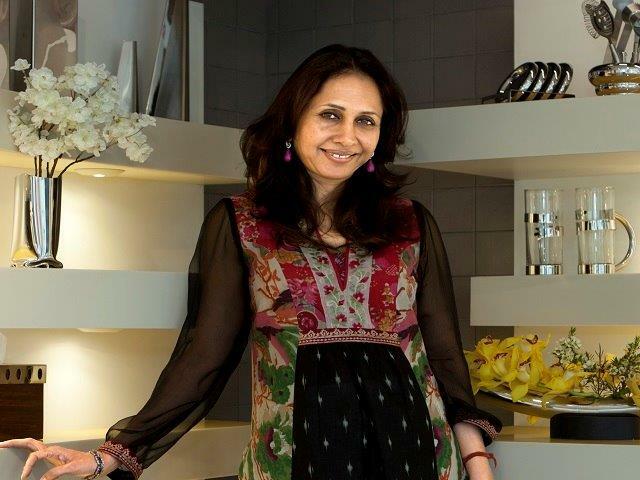 Our kitchens are a platform for a journey of constant discovery”, says Arttd’inox Founder Deepikka Jindal. Today, Arttd’inox is a leading brand in India in the lifestyle luxury tableware/ home decor category and very successfully diversified into some other categories of the home segment such as high end SS modular kitchens, SS wardrobes, et al. I started Arttd’inox in 2003 with the support of my family as creativity was innate and came from within me. Over the last few years, the journey has been exciting and challenging, and it’s great to see how the brand has evolved into an aspirational and sought after luxury brand in the country today. The brand has been steadily growing over the last few years – we are constantly innovating and unveiling new product lines, getting into newer verticals, tying up with designers such as Suneet Varma, Saahil and Sarthak, and growing our retail presence. Initially the biggest challenge was to deliver and design Stainless Steel products as the entire team was new to a material like stainless steel and even the backend team was unskilled and did not know the standards for good quality and timely deliveries. Our consumers were new to designer products in Stainless Steel, thus were hesitant to spend money on a designer stainless steel product. Also, at one point of time, we expanded fast and set up stores in high street locations paying high rentals, which did not allow us to grow as we spent more than we earned, but soon we learnt our lesson and restructured every aspect of the business. On the creative side, I would say the challenge has been to marry Indianess of designs to a modern material like stainless steel. As a brand Arttd’inox takes cognizance of the changing sensibilities & aspirations of the consumer. Today Arttd’inox is one of the few Indian brands that stand for luxury in the lifestyle space in India. This brand is truly an Indian brand we embrace the fact of being Indian. The brand has witnessed a phenomenal design and business growth, design wise we are creating some wow products, where each one of them is high on innovation is extremely functional. We have had strategic partnerships with Suneet Verma/ Saahil and Sarthak – who have lend their design ethos to Arttd’inox and helped the brand position itself in the luxury segment. From a business point of view, we opened a 10,000 square feet store at MG road last year, which is our flagship store, and today we have over 12 stand alone stores of the brand. Recently we added stores in Hyderabad, Jaipur and Kochi as well. We have also expanded our product line up and have launched high end vanities, wardrobes, domestic railings and high end furniture in the stainless steel category recently. While the core design language of the brand stays constants as being elegant and functional, yet we also constantly evolve and offer designs to suit the ever changing needs of our customers, recently we entered into strategic partnerships with Suneet Verma and Saahil and Sarthak – who have lend their design ethos to Arttd’inox and have helped the brand to position itself in the luxury segment. We have started doing vanities, wardrobes, metros, railways and we are opening our self to public spaces. From a retail footprint point of view, we want to be present in 20 locations by the end of 2017 and are targeting 50 stores by the end of 2018. I can foresee immense growth and opportunity going forward, as India is of course booming and the consumer base is growing and expanding not just in metro markets but also in the Tier 2 towns. For me, every day where the consumer connects with my brand and its ethos is a key moment. Every time when people appreciate the hard work for my team is my real reward. No other award has ever given me the pleasure that an appreciation from the client does. On getting my first order I had mixed feelings. There was happiness of getting and at the same time there was worry of execution with right quality standard.